Greetings from Western Australia! 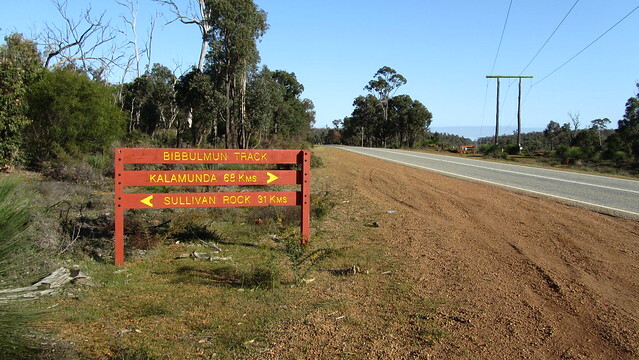 It has taken a while coming, but here is the first posting of my Bibbulmun Track attempt; Section One - Kalamunda to Dwellingup. Get a cup of tea and a comfortable seat, because this post is a long one! I was up and out early; no fanfare, no send off. Kevin, Sue and James were at work, and Cameron was sound asleep in his pit; it all seemed a little anti-climatic. After my train and bus ride, I arrived in Kalamunda and wandered to the Perth Hills Visitor Centre to sign the log book for the walk. The staff there were extremely supportive and I even got my photograph taken for the next Bibbulmun Track Foundation newsletter. They asked that I come back at the end of it all and tell them my thoughts on the trail. So, a lonely self-portrait taken at the start and I set off at 11:15 am. It was to be a short day to acclimatise to walking with a heavy pack but I was soon feeling it in the midday heat. I figured it would take a while to get away from built up suburban areas, but was pleased to see this was not the case. From the terminal, it was through a small section of scrub to Spring Road, where you veer right, descending passed an old golf course and down a creek towards Piesse Brook. I was delighted to see, contrary to what I had been told by some bloke at the airport, the wildflowers were out, and it eased the mind having something beautiful to focus on, making the labour more bearable. Add to that, the streams were running nicely, and that was a comfort. When I climbed up from Piesse Brook, I took my first break half way. This was bloody hard yakka! 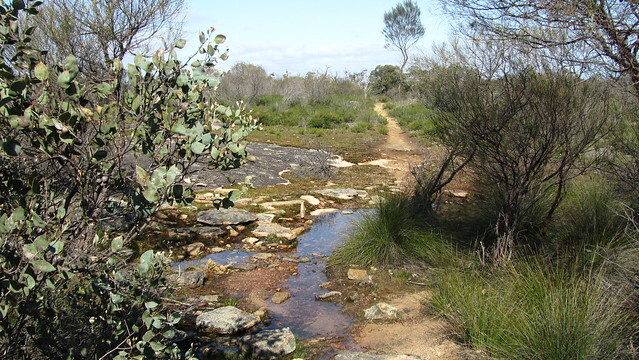 The struggle eased when I the track levelled out a little, a gentler incline through the Jarrah and Marri Forests of the Kalamunda National Park. Good paths, though, and the regular waugals and signage kept me from straying. I crossed a dirt track named Fern Road, the first access point for day walkers and an escape route for those wishing to bail on their Bibbulmun thru hike. Back into woodland, I managed to bump into some tourists taking a camel ride. I was nearing Paul's Camel Farm, on Pauls Valley Road, where I was intending to take a break. The farm has a cafe, and I couldn't turn down the opportunity of a cup of tea, a slice of cake, and the use of a proper flushing toilet, especially as this was to be my last for a week or so. Fed and watered, I continued on, through a shady patch of Banksia, across Asher Road, and then a descent to my home for the night. 45 minutes from the camel farm, and I was at Hewitts Hill Hut. Now, before I embarked on this adventure, I envisaged that one of my biggest challenges was going to be spending nights alone on the track. To my utter amazement I had spent four of my five nights alone on the Overland Track, and I had not slept all that well. 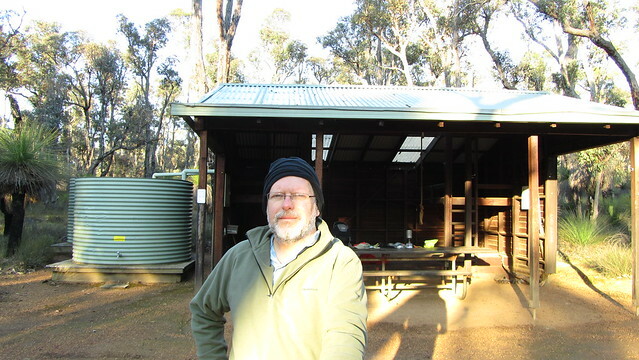 For my first night on the Bibbulmun, however, I had no such worries, and when I arrived I found I had the company of Diane and Erica, two Aussie bushwalkers on an overnight from Mundaring Weir. I took the lower bunk in the shelter, and began an orderly routine that, all being well, I would be undertaking every night for the next two months; unpack, set up my sleeping arrangements, wash and change into camp clothes, collect water, cook, eat, chill out and then sleep. First impressions of the campsites and the three sided shelter systems were favourable. Sure, it meant the the local wildlife could wander in, on this occasion a cocky magpie who had taken an interest in my cooking. I was also impressed by the drop toilets. I was soon to find that quite a few of them were kept supplied with toilet paper, by the track volunteers, although I wouldn't depend on it! The nights, at this time of year, close in quickly, and I was soon in bed around 7pm, with my Kindle. There was just time for two more arrivals, though, a father and son, who took the bunk above. I slept little, it would take a few days to get used to a routine, and was out on the trail at 7.15am. There was a touch of mist early on, as I made my way to Mundaring Weir. As I approached the weir, my SPOT batteries ran out. They were rechargeables, and not up to the job, obviously, so I had to think of a way to get off the trail and get some new ones! Luckily, Diane and Erica caught up with me at the weir and I asked them to give me a lift to a town with a supermarket. Mundaring did the trick; a rush into Coles supermarket, and then the two ladies kindly dropped me back at the track. I will always be grateful for their help! Onwards, I met a group of four, Paul and his son Nathan, and Tony and his son, Mitch. For the rest of the day, were were to bump into each other. I lunched at Ball Creek Shelter, and then onto Helena. As we neared the end, we passed a group of thirteen, and mindful of the shelter space, we stepped up the pace to beat them to the hut. It was great to have company once again, with Tony, Paul etc. but the thirteen turned out to be a bible group and their religious rants and singing weren't appreciated. Once again, when the light disappeared, about 6:30pm, those in the hut were tucked up in bed, whilst the bible group carried on around the camp fire, holding a little prayer session and sing song. Not really appropriate given they were in mixed company. Set off at 7am. Chinamans Gully was a tough climb out; up to 300m before descending to the Helena River. Then came a gradual ascent that was more to my liking. Got to Waalegh about 11:15am where I had some lunch. The rest of today was fairly flat. Two blisters were beginning to form on each little toe, but they hardly hampered my pace, and I had the beautiful wildflowers to distract me. I arrived at Beraking at 2.15pm. Cold and breezy, I spent the afternoon eating. The bible club turned up and because of the weather, it was very crowded come dinner time. 7:15am, on my way after saying goodbye to Tony, Paul, Nathan and Mitch; good company for two days. On my way out, I spotted my first kangaroo; always a special moment, but sadly, no photo. No matter, I was thoroughly enjoying the riot of yellow that was lining my way on this section! By about 10:20am, I was surprised to be passed by Tony and Mitch, going at quite a pace to Dale Road, where they would be picked up. Despite it's name, Mount Dale isn't such a climb, and it was pretty easy. I lunched at Mt. Dale Campsite and the remainder of the day was flat and no dramas, but hot in the afternoon sun. I arrived at Brookton Campsite at 1:45pm. With the bank hoilday finished, this was to be my first night alone. I was in bed by 6:30pm, as the sun set, and read for a while. I was awoken around ten by a barking noise; not that of a dog, but of some bush animal having a bit of a territory dispute. The usual departure at 7:15am. A long day ahead today, of 27km. To help, I set myself targets, or tick lists, along the route. The formation of note was Abyssinia Rock; an impressive granite outcrop. Reached Canning Hut at 10:15am, quick break and then 15km to the next hut. It was a hot descent down to the Canning River. I had hoped for a shady retreat for lunch, but I had to steal 5 minutes under a shady tree. The track was made easier by a bed of pine needles cushioning my footfall. Once I had exhausted my tickoffs, I was at Monadnocks Campsite, and more company. A guy called Ross, with his son Lachlan, and a couple called Ian and Bernadette. Ross and Lachlan were new to the bushwalking lark, but were getting keener and eager to pick up tips on lightening their loads. Ian and Bernadette were regulars, having also walked the Overland Track in Tasmania. We had a good chat around the camp fire; looks like Ian and Bernardette would be joining me the next day at Mount Cooke. A later start as the distance was short today; 8:15am. Up and over Mount Cuthbert was easy in the cool morning. Mount Vincent was rockier and more of a challenge. On my way down I met a bushwalker going north, called "Pedestrian Pete". He gave me plenty of advice about snakes, although I am still to see any. 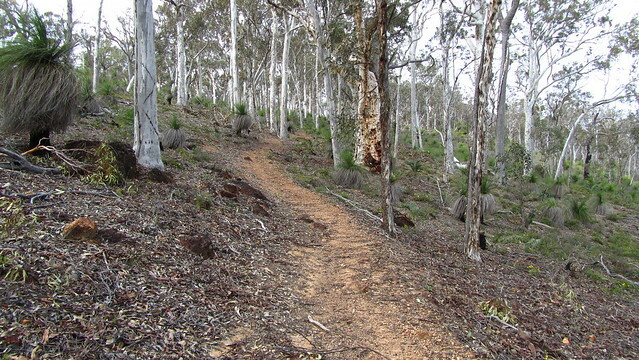 From Sullivan's Rock Spur, it was steady walking in low scrub and then shady forest. I arrived at Mount Cooke hut just after midday, and made myself comfortable for the afternoon. Ian and Bernadette arrived a couple of hours later. We also had a new visitor; A 29 year old called "Dropbear" arrived at 3pm. He was doing an End to End in forty days, and would turn out to be my companion all the way to Dwellingup! Dropbear and I were up at 5am and on the trail forty-five minutes later. We took advantage of the cool conditions and refreshing breeze to climb Mount Cooke, where the visibility was perfect! Today was a long haul in thirty degrees so we wanted to get the bulk done with before the worst of the sun. An early start means we saw a few kangaroos, and I even got a picture! We reached Nerang campsite at ten, and stopped for twenty minutes. We met our first South to North End to Ender, named "Bird". I envied that he was just five days to the end of his journey, especially in this heat. The 16 kilometres to Gringer Creek had to be the worst; flies bugged the hell out of me, and I choked on one. I even had the first tick on me, although it hadn't buried its head to feed on my blood yet; Dropbear wasn't so lucky! We made it to Gringer Creek by half two; a great effort. After a freshen up I wandered to the North Bannister Roadhouse on a spur trail, to pick up the first of my food drops. Had a cup of tea, and a thirst quenching iced tea. In the evening, Dropbear lit a fire and we had a clear night for some great star gazing. Up at 6am, I found myself cornered by a spider in my bed. A quick fumble for my head torch, I made sure it wasn't a redback before snapping one of the strands of web, and seeing the rest hurtle up to the ceiling, with the spider! Off at 7am, saw three more roos, doubling my count to six. We crossed the Albany Highway; strange to think that a car journey of a few hours would see us at the Southern Terminal, as opposed to fifty or so days. It was an easy unsealed vehicle track to the foot of Boonerring Hill, with an abundance of opportunities to snap some wildflowers. We also say our first Wedge-tailed Eagles, being harassed by some crows. The climb up the hill was exerting, but I had my legs in now and each ascent is getting easier. The summit is reached by a spur trail, and we dumped our packs to visit the top. I'm sure the views are great, but we only got to see some wet stuff heading our way, so we made a hasty retreat to our bags and the rest of the walk. We descended a rocky and unkempt part of the track, and made our way to the next lump in our way; Kimberling Hill. 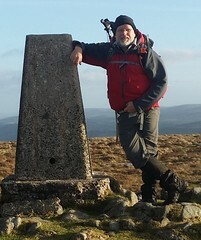 At the end of a day, this seemed a never ending ascent, but finally it dropped to White Horse Hills campsite. Just as we arrived, at 12:45pm, the rain began. There was one other camper; Ritchie. He was walking from Dwellingup to Kalamunda. He was a colourful character; he had already walked the track, had many tales of his jobs catching reptiles and snakes in the Pilbara, digging test holes for a mining company, driving across Australia for the hell of it..
We spent the afternoon chatting, reading, eating, drinking coffee. In the evening, Ritchie expertly lit a fire and tended to it constantly, whilst he spun his yarns on relationships and life. A double hut day and 30km to tame. Up at 5:20 am and away in the mizzle nearly an hour later. Turns out Kimberling Hill wasn't finished with us yet, and had a second lower summit. Had the weather been good, it would have afforded a great photo opportunity, but my camera stayed safe and dry in my rucksack. All day, rain came and went, but the trail was good, using old vehicle tracks. We were up at Mount Wells shelter at 10:15am. This is the only shelter on the entire track that is fully enclosed. It was former accommodation for those who attended to the fire watchtower that sat beside it. It wasn't very welcoming, though, and I was glad I had decided to skip it. We stopped for an hour, for lunch. With 15km left to go, as we descended, we were both beginning to feel niggling pains. Dropbear's was more worrying, as he suspected it might be shin splints. We slowed our pace and enjoyed the scenery, which was far better (apart from the scar of the Boddington Gold Mine) than our last double hutter to Gringer Creek. We arrived at Chadoora close to four in the afternoon; by far our longest day. Already there and with a fire going, was Graham, a 61 year old out for a ramble from North Bannister to Dwellingup. He was pleased to see us because he had someone to take a look at a tick he had on his back. It was a big bugger, but there was actually six! Dropbear had a go at removing them, and was partially successful, before having to attend to one of his own! So far, I have escaped this joy; maybe they don't like my pommie blood! As the evening went on, the weather brightened and we had our thoughts on the walk into Dwellingup tomorrow. Off at 6:15am, a misty morning with plenty of wallaby sightings. By the time we had reached an old railway line, the sun had appeared and it promised to be a pleasant stroll into town. However, after we took a break at Etmilyn Siding; a station platform, the trail took a turn for the worse. Between here and the old township of Hollyoake, the path was the most overgrown we had encountered and our march through the bush was made all the more frustrating by the flat railway line that stayed between 3 and 30 metres away. But the purist in us kept us on the right path and when we got through the worst, we took off our shirts and did a quick tick check; thankfully all clean! At Hollyoake, things were more sedate. We strolled into Dwellingup just before midday. Dropbear said goodbye as he made for a telephone, whilst I went to the Visitor Centre to sign the log book. I thought I might see him again, but our paths didn't cross, and hopefully he'll find me on Facebook and we can go for a beer in Perth at the end of all this, as I really enjoyed our few days together. I know he'll be in the log books, so I hope he leaves a way to get in touch; stupid of me not to get a contact number. The rest of my day I settled into the Dwellingup Chalet and Camping Park, went to the Blue Wren Cafe for a steak burger and chips, and got my washing and food ready for the next leg in a couple of days time. Wow!, getting up late, well, 8:30am anyway, had left me with the feel of a hangover! I was missing the track and eager to be on my way. The idea of an extra rest day had lost its appeal; well at least if I was to spend it in Dwellingup. No disrespect to the town, but it is sleepy and I was restless here. I had a number of tasks today; Send a few items, back to Perth, that weren't used on the first 202 kilometres so would not be needed for the rest. Go shopping for new socks and some other items that need replenishing such as food, and also ring Collie to bring my booking forward one night. All done without a hitch, I considered going about midday, but in reality, there were still a couple of items to do; charge camera batteries, headtorch and my Kindle. Late in the morning, I wandered to the Visitor Centre to use their internet, but found it was shut on Monday and Tuesdays. I was definitely out of here tomorrow! Late afternoon, a cyclist arrived at the park; Sean was 61 and doing the Mundabiddi Trail, a 1000km cycle route from Mundaring to Albany. We got talking and ended up down the Community Hotel for a couple of cold ones and dinner at the Blue Wren.